A Military Air Transport Service C-121G Super Constellation flying near the Golden Gate Bridge. The Lockheed C-121 Constellation is a military transport version of the Lockheed Constellation. A total of 332 aircraft were constructed for both the United States Air Force and United States Navy for various purposes. Numerous airborne early warning versions were also constructed. The C-121 later saw service with smaller civilian operators until 1993. Lockheed's first attempt at a military version of the Constellation airliner had been unsuccessful. This was largely due to the problems encountered by the Wright R-3350 engines that powered the aircraft. After the war, the few military Constellations built (designated C-69) were retrofitted by Lockheed for use in the post-war airline industry as the L-049. In 1947, Lockheed unveiled a more economical Constellation. The L-749 as it was known, had extra fuel capacity and a more economical version of the R-3350. However, Lockheed had lost 1200 workers that same year. By 1948, production of the L-749 was at a near halt. It was then that the United States Air Force (USAF) signed a contract with Lockheed for ten L-749A aircraft designated the C-121A. The United States Navy (USN) had also placed an order for two AWACS versions of the L-749A designated the PO-1W (later WV-1). The first L-749A variants off the production line were for the US military. The C-121A versions differed from the L-749 only through having a reinforced floor to handle cargo, and a large aft loading door. Although originally intended for cargo transport duties, they were usually fitted out with 44-seat passenger transport interiors. The aircraft also consisted of a five-man crew with four relief crew members on standby. All C-121As were assigned to the Atlantic division of the Military Air Transport Service (MATS). The aircraft would later see service in the Berlin Airlift. Dwight Eisenhower and General Douglas MacArthur both used the C-121A as their personal VIP transports. In 1950, six of the C-121A Constellations were modified as VIP transports and redesignated VC-121A. The last C-121As were retired in 1968. In August 1950, the USN ordered eleven passenger/cargo convertible versions of Lockheed's stretched L-1049B Super Constellation (which it had already ordered as the WV-2 AWACS platform). These aircraft, originally designated R7O, were delivered before the WV-2 aircraft due to the R7O being more simple to produce. The R7O (now R7V-1) first flew in 1952. The R7V-1 was able to be quickly converted between a passenger transport for 97-107 individuals or a cargo carrying transport in two hours. The Navy reduced the number of available seats to fit room for life rafts on overseas flights. 73 stretchers could also be used for medical evacuation flights. The R7V-1s saw service over the Atlantic and Pacific in squadrons VR-1 (the oldest transport squadron in the Navy), VR-7 and VR-8. Two modified R7V-1 aircraft were used on Antarctic supply missions while conducting tests and observations at the same time. One crashed on landing in 1970 and remains at the spot to the present day; the other was retired in 1971. In 1962, 32 of the 50 R7V-1 aircraft in Naval service were transferred to the Air Force, being re-designated the C-121G. The remaining 18 in Naval service were redesignated C-121J. One C-121J was later used by the Blue Angels until it was replaced by a Lockheed C-130 Hercules in 1971. The USAF had also ordered 33 L-1049F Super Constellations in 1951, designated the C-121C. Unlike its Naval equivalent, the C-121C featured square cabin windows instead of round ones. Otherwise, the C-121C resembled the USN R7V-1 aircraft. The C-121C also featured a reinforced structure to handle turboprop engines if necessary. Other features of the C-121C included an Auxiliary Power Unit Turbo-compound R-3350s and the ability to carry 75 passengers, 72 fully equipped troops, or 47 stretchers. The seats could be stored under the floor of the aircraft when needed for cargo use. The first flight of a C-121C was in 1955. Deliveries began in August 1955, with aircraft being assigned to the MATS Atlantic division. The aircraft were later in service with the Air National Guard (ANG) and were retired in 1973. Four were later refitted as VC-121C VIP aircraft, six as EC-121S TV and radio broadcast relay systems, two became EC-121C Microwave Airborne Radio Communications (MARCOM) systems and one was converted to a DC-121C observation aircraft. 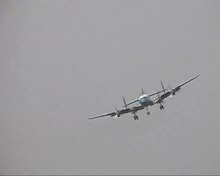 A video of the Super Constellation Flyers Association's C-121C in flight. After military service, some C-121s and R7V-1s were used by civilian operators as cargo aircraft. The last operators were small Dominican Republic cargo airlines that operated to Miami with surplus military Constellations bought from Davis-Monthan Air Force Base. The operations stopped in 1993 after the Federal Aviation Administration (FAA) banned these operators from flying into the United States due to safety concerns. Two former C-121Cs fly today with the Historical Aircraft Restoration Society of Australia and the Super Constellation Flyers Association of Switzerland. Initial variant, based on the civil L-749 Constellation. Nine built. Six C-121A transports converted to VIP use. Originally designated PC-121A. Similar to the VC-121A, but with the cargo door replaced by a smaller passenger door. One built. Initial variant based on the L-1049 Super Constellation. 33 built. VIP conversion of four C-121C aircraft. President Dwight D. Eisenhower's personal VC-121E, called Columbine III. Ordered by the United States Navy as a R7V-1 but modified before delivery as a presidential transport for the United States Air Force. Two former United States Navy R7V-2s with Pratt & Whitney T34 turboprop engines transferred to the United States Air Force. Designated L-1249A by Lockheed. Redesignation of 32 R7V-1 transports transferred from the USN to the Air Force. Three C-121Gs converted to AWACS crew trainers. One C-121G converted to a VIP transport. Initial Navy version based on the L-1049. 50 built. Originally designated R7O. One R7V-1 modified for Antarctic service. Two transport aircraft similar to the YC-121F. Also designated L-1249A. Two built. Four C-121J aircraft converted for VIP use. One operated with the Blue Angels. Data from Lockheed Constellation:From Excalibur to Starliner. ^ Breffort 2006, pp. 146-159. ^ Breffort 2006, pp. 166-169. ^ Breffort 2006, p. 175. Breffort, Dominique (2006). "Lockheed Constellation: from Excalibur to Starliner Civilian and Military Variants". Histoire and Collecions. Paris: Print. ISBN 2-915239-62-2. Winchester, Jim. Lockheed Constellation (Classic Airliners). St Paul, MN:MBI Publishing 2001. ISBN 0-7603-1198-6. Wikimedia Commons has media related to Lockheed Constellation. Lockheed Constellation Survivors - A website that explains information and whereabouts of surviving Constellations of all variants, including the Super Constellation.